This house was built in 1912, by Dr. Hugh Altnow, who lived in the home from 1912 to 1924. The mail-order home came pre-cut and was shipped to Bingenheimer Mercantile Company. The home is a classic Arts-and-Crafts bungalow design, a one-and-a-half story dwelling. It features built-in china cabinets and bookcases, box-beam ceilings, and original light fixtures. A particular feature of this home is that all the hardware matches, from the drawer pulls to the doorknobs. The foundation is very unique; it is made of prairie stone. The wide eaves of the home are typical bungalow design. In the front yard of the home, the original hitching posts from the original wood Saint Joseph Church are on display. Dr. Altnow would eventually decide to specialize his practice toward children’s diseases and moved to the Twin Cities. He would also eventually go on to start the Henniepin County Clinic in Minneapolis, MN. 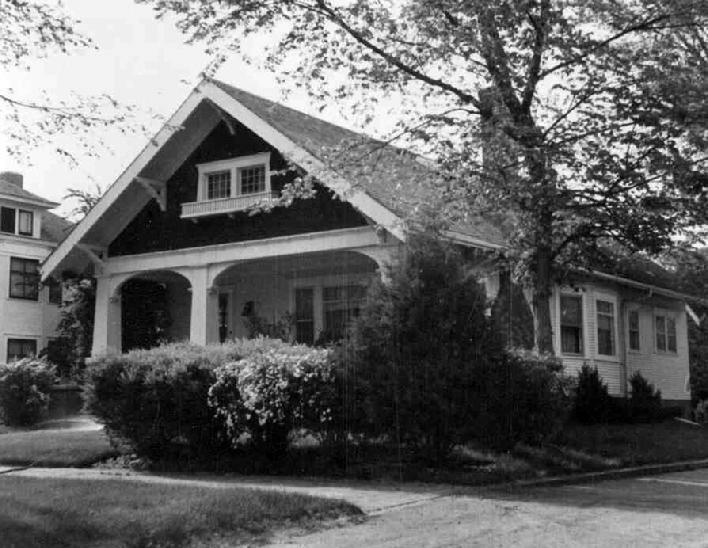 In 1924, Altnow sold the home to Dr. Cecil Smith. For 25 years Doctor Smith served as local physician for the Northern Pacific Railroad, as well as school physician for the State Industrial School (now know as the Youth Correctional Center). Dr. Smith was also founder of the Custer Health District. The home was occupied by the Smith family from 1924 until the death of Dr. Smith’s wife, Winifred, in 1976. The home was purchased by Bob and Gloria Feickert who lived in it until 1988. Bob and Gloria were employees of the Bismarck Tribune. Gloria also worked for Dr. Smith when she was in high school. The photo is the Smith family residence in early 1940’s.